The Our Christian Life and Ministry midweek meeting was introduce in January 2016. As a result, beginning with version 16.0.0 the old Service Meeting editor was replaced with a brand new editor. Please review this help topic to familiarize yourself with the editor. The Coordinator of the Body of Elders has been instructed to prepare a schedule for the complete meeting. As a result, there is a lot of information that needs to be entered. Your computer screen resolution must be set to a minimum height of 768 pixels. A warning is displayed if this requirement is not satisfied. If your resolution is correct, but you still find that you can't see all of the controls, then please have a look at your operating system text size. If it is set to the default size then it should all fit on. This will not be an issue for you if you have a larger screen. 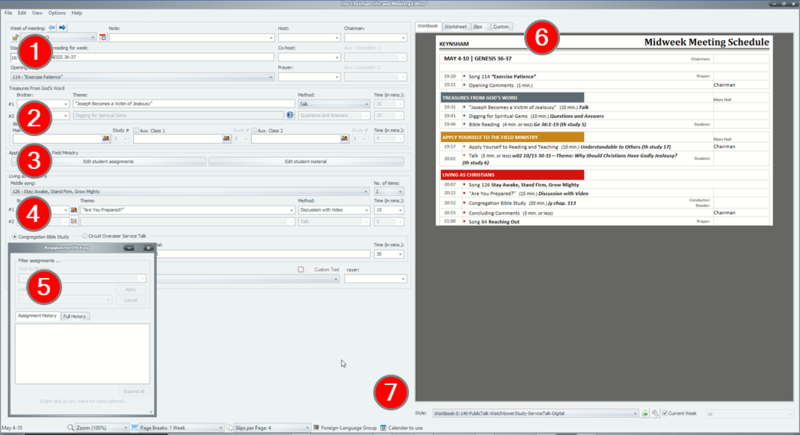 You should find all the information you need to understand the functionality of the Midweek Editor. The links provided below will take you to the respective topics.